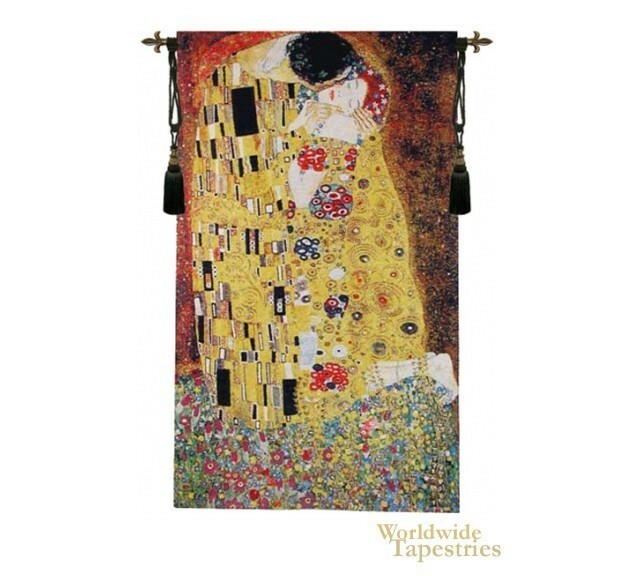 The Kiss VII - Klimt tapestry shows the detail based on the work by Gustav Klimt, showing the woman in a passionate embrace. Here we see her kissed by her lover, in a sublime and abstract, yet geometric style of garments around here and plumes of light. Some say that the haloes around them and the robes is a visual representation of their passion and love. Here we see the flurry of activity in the scene based on the use of color, pattern and a floral theme. It is one of Klimt's most well-known and well-loved works. Based on the lurid use of color, theme and visual style, it is not hard to see why. This art tapestry is backed with a lining and a tunnel for easy hanging. Note: tapestry rods and tassels, where pictured, are not included in the price. Dimensions: W 36" x H 60"
Dimensions: W 48" x H 80"